Last date place before all the guests arrived for our wedding. 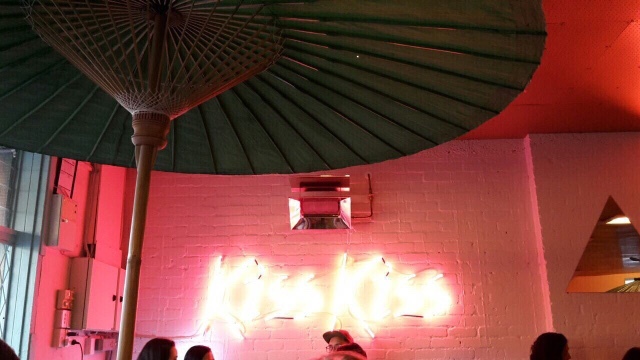 Kiss Kiss is a fusion Asian eatery dressed in pink kitsch-ness off Dominion Road. It's a younger sibling of similarly popular, and blue-er, Chinoiserie in Mt Albert. A step inside Kiss Kiss I had the impression I was transported to a beach side cafeteria while on holiday - was it the picnic tables and huge colourful beach umbrellas over us?! A cool glass of house beer and bao buns make for quick and easy date meal.